with the Black Out Contacts from cococontacts.com. As seen on TV in the new vampire series "True Blood". The eyes of the vampire turn black when their fangs came out. This standard pitch black contact lens is completely black therefore it will make your eyes look rather large, dark and creepy. Black is the ultimate color for anyone aiming to achieve that “gothic” look, though it remains a popular choice for Vampire costumes aswell. Many pop culture/comic book characters have solid black eyes also, thus if you're hoping to to pull off every detail of your superhero costume, this is the perfect style for you. Look wild and gothic with these black freaky eye contacts. These black contact lenses are excellent for halloween. The pitch black contact lens is all black inside so it will make your eyes look very big, dark and creepy. Black is the ultimate color for gothic contact lenses but you can also try on the white contact lenses which are also fun to scare your gothic and emo friends. Nothing could be freakier than having pitch black eyes. Look utterly vampire-like and menacing with a pair of Coco Contact’s Wild Vampire black lenses. Give people fright with a single, piercing glance. Get your pair now! It’s fun to be a freak. This Halloween try on some weird halloween costumes most common would be a scary vampire with black eyes or a creepy black cat. You can also dress up as a black animal such as a black panther or something a bit more scary like a Wicked Witch. 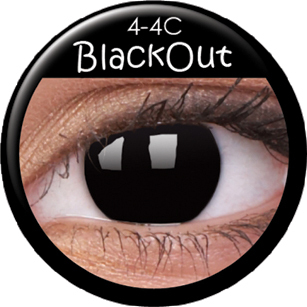 A pitch black costume would benefit from pitch black contact lenses because it would be the last touch to your halloween outfit. Some other quick easy halloween costumes would be to put an all black contact lens in each eye and then just paint your face white and put flour in your hair to give the colors a nice back & white contrast. to your eyes. Having plain white eyes can be downright disturbing and freaky.